Policies that increase the number of people walking and bicycling appears to be an effective method for improving the safety of people walking and bicycling. 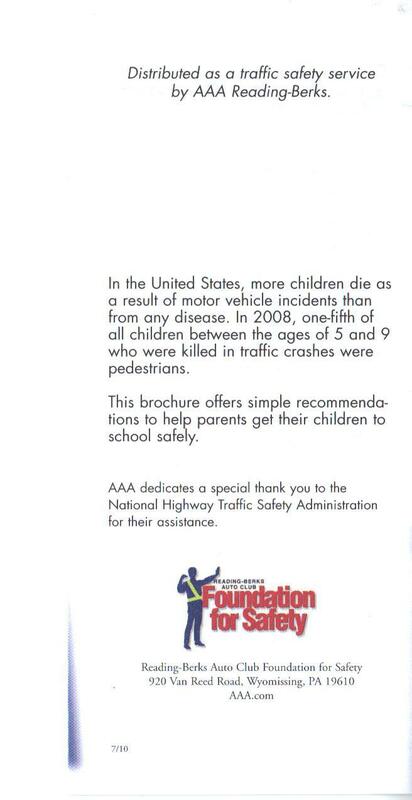 Safe Kids, through the AAA Reading-Berks Foundation for Safety, have provided years of pedestrian and bicycle safety education to our children and their families. 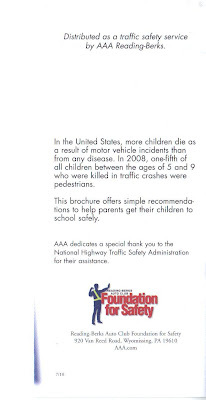 Today, I found this brochure in my son's school folder. If you are a parent or guardian of a school-age child living in Berks County, you are likely to have already read this brochure. This brochure comes at a very significant time in the WalkBikeBerks annual calendar -- just as we are gearing up for International Walk to School Day. It is my sincere hope that every driver, bicyclist, and pedestrian is protected from harm. I hope too that the work of WalkBikeBerks with the support of Safe Kids and the entire Berks County community works together to make it safer for our children to get to and from school every day. Let's make a special effort in October -- for the kids? Birdsboro Elementary Center will partner with WalkBikeBerks and celebrate National Walk To School Day. This day is dedicated to raising awareness of walking to school, improving walker’s safety, and encouraging more children to walk to school. Birdsboro Mayor Myers, Interim Manager Aaron Durso, WalkBikeBerks President Nancy Kaufman, Principal Mary Beth Kiesel, Physical Education Teacher Dee Stamy, and parents will walk to school together for this special event. Walking Route: Route can be found on the above link. Walk to School Day Sponsors -- We can't do it without Your Help. 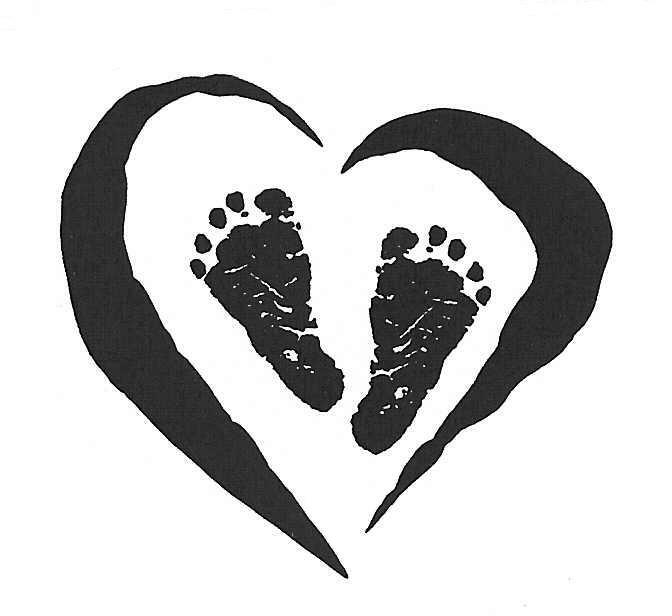 A CLEAN, HEALTHY, SAFE WORLD FOR OUR CHILDREN! Thank you J.P. Mascaro & Sons for your financial support. On Wednesday, October 6, 2010, WalkBikeBerks will celebrate Walk (Bike or Roll) to School Day throughout Berks County. We want to invite you and your community to become part of the county-wide movement to end childhood obesity. Changing behaviors requires creative solutions that are safe and fun. A county-wide Walk (Bike or Roll) to School program can be both. Through our Walk (Bike or Roll) to School program, our volunteers offer education and skills programs and teach children and parents about physical activity such as walking and bicycling - which are essential to defeating this obesity epidemic. With your support, WalkBikeBerks can help parents and children improve their weight management efforts and continue to make elected officials aware of the dangerous physical, mental and emotional consequences associated with childhood obesity. What can you do right now to help us end childhood overweight and obesity? Support us with a donation to Walk (Bike or Roll) to School Day 2010. We can only stop this crisis with your help - any amount will make a difference to a child in Berks County. Please donate to WalkBikeBerks today. Donate Now. We also encourage you to contact your state representative and ask them to encourage PennDOT to ensure that Safe Routes to School Grant Awards begin building projects immediately. Participate in Walk (Bike or Roll) to School Day on October 6th. AAA Pushes to Cut Trail Funding. Speak Up Now! We have received this letter from the Rails-to-Trails Conservancy. We felt that it was important to share with our WalkBikeBerks' members and readers. Ask AAA to be part of America's transportation future! Sign the petition. These programs have played a major role in the development of more than 19,000 miles of rail-trail across the country, most likely including your favorite local trail. 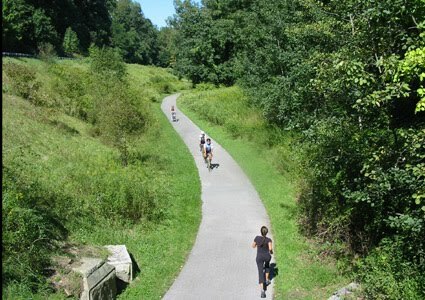 These trails and other walking and bicycling facilities allow individuals across the country to enjoy the outdoors and safely and easily travel without a car for many short trips—while saving money and gas, and getting exercise in the process. AAA has forgotten that bicyclists and trail lovers drive, support AAA, pay gas taxes and want balanced transportation systems that provide the choice to get around in a variety of ways. Help us help them remember! want safe, convenient places to bicycle and walk. AAA, be a part of America’s transportation future! of getting around—including trails, bicycling and walking! Go to the petition page now. 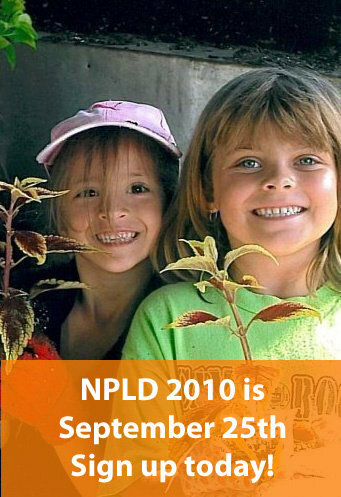 Saturday, September 25 is National Public Lands Day. The event at Blue Marsh will start at Vista Pavilion at 8:30 a.m. and will run to 3:30 p.m. Bicycle Ride, Walk Bike Berks, Connector Trail 9:00 a.m. I hope all of you can make it. Thank you for all of your support! Congratulations members and active volunteers of WalkBikeBerks! Please write to the editor of the Reading Eagle RIGHT NOW and let them know how much we appreciate their support of our needs. Why write to the Editor? Because your words reach a broad and varied audience of business owners, municipal and state leaders, school boards, and others who make transportation decisions daily. If you want to do something to make walking and bicycling better in Berks County, write your letter and submit it today. The Reading Eagle and all of the readers are waiting to hear from you. Let Us Help You Celebrate Walk to School Day This Year! WalkBikeBerks would like to help you celebrate International Walk to School Day on October 6, 2010 as part of your Safe Routes to School program. Please let me know what we can do to help. Gained food and drink sponsorship from local groceries. Conducted walkability audits to help improve the overall safety for children and families who choose to walk and bicycle to school. Our mission is to make walking and bicycling practical, convenient, and safe transportation. We are here to help you. Just let us know how. Some members of the Senate, however, prefer a watered-down version of the bill that would only apply to new drivers and would make it a secondary offense. It is unsafe for any driver to be texting behind the wheel, and the people of Pennsylvania know it. Let’s send a clear message to the Pennsylvania Senate that we want a strong bill that applies across the board, and let’s make it a primary offense. This will make our roads safer for all users, especially pedestrians and bicyclists. Write or call your Senator now using our easy online tool. Or Use these contacts and the Form Letter Below, as I have done. Drivers distracted by cell phones are making Pennsylvania's roads a dangerous place for all road users, especially pedestrians and bicyclists. I urge you to support a bill that restricts drivers across the board. Cell phones and text messaging are a distraction to all drivers, regardless of age or experience. The verdict is in: using a mobile phone while driving reduces reaction time. To ensure enforcement of the restrictions, I urge you to support a bill that makes this a primary offense. Please act now to improve the safety of Pennsylvania pedestrians, bicyclists, and all road users. Imagine riding your bicycle to work on a summer day without needing to change out of sweaty clothes once you arrive at the office. Or having a bike that gives you a little push up that steep hill by your house. Bicycles exist that provide this extra boost and power. 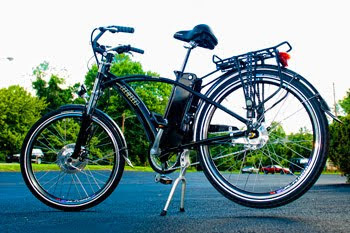 But unlike the entirely pedal-powered cycles like the one you learned to ride as a kid, these electric bicycles have battery-powered motors to help push the rider along when pedaling isn’t quite enough. They’re popular in China and Europe and somewhat common in the U.S. on the West Coast and in the South. They haven’t quite caught on nationwide because few bicycle shops sell them, but that’s changing ever so slowly, says Dr. Frank Jamerson, publisher of the Electric Bikes Worldwide Reports. And in Pennsylvania, a growing number of retailers are stocking this new form of transportation. Walkable Reading -- Say Yes! If you were able to catch this story in the Reading Eagle, then you know that consultants are encouraging a more walkable plan for the shopping district in downtown Reading. WalkBikeBerks understands that these things don't 'just happen' on their own. Good things come as a result of the efforts of good people doing good work. If you are one of those who support livable streets -- you know, the kind where it's easy and safe to stroll along store fronts and window shop -- it's time for you to let others know. I encourage you to start typing now. Write a Letter to the Editor in response to this story and support a Complete Streets plan: designed and maintained as a safe and attractive public space that supports walking, bicycling, and public transit. Together, we can build a Livable City! Letters should be brief (about 200 words) and address a specific topic of general interest. For verification purposes include your full name, address, and telephone number (day & evening) also please include your e-mail. Concise letters will get preferential treatment and are less likely to be condensed. Students across the region walked, biked, rode the bus to their first day of school on Aug. 30. On Wednesday, October 6, 2010, WalkBikeBerks will celebrate Walk or Bike to School Day throughout Berks County. We want to invite you and your community to become part of the county-wide movement to Fight Childhood Obesity. Changing behaviors requires creative solutions that are safe and fun. A county-wide Walk or Bike to School program can be both. Through our Walk or Bike to School program, our volunteers offer education and skills programs and teach children and parents about physical activity such as walking and bicycling - which are essential to defeating this obesity epidemic. We strongly encourage everyone to plan to include children and adults of all abilities. Walking one mile to and from school each day is two-thirds of the recommended sixty minutes of physical activity a day. Plus, children who walk to school have higher levels of physical activity throughout the day. With your support, WalkBikeBerks can help parents and children improve their weight management efforts and continue to make elected officials aware of the dangerous physical, mental and emotional consequences associated with childhood obesity.